I have a solid beauty routine, which kind of gives me comfort and makes me feel my age. Never ever could I leave out one of the things I use, especially not my eye cream – mainly because my age is crucial and I have the darkest rings under my eyes. Good thing for me and others that are suffering with age (haha) and eye bags (that are definitely not Chanel!!) that there is Caudalie Premier Cru Eye Cream. You should know that I have been a huge fan of their eye cream which I let you know so many times in my beauty favorites. So I was very excited to try the Caudalie Premier Cru cream. The cream is thicker than the usual eye creams I use, which gives it that moisture that my eyes need. It also promises to smoothen the lines and leaving you look fresher than before. I did feel like it did have a minimal impact but it could also just be in my head. But for the start 2018: Anti-Aging aspect ? Check! Last year christmas I really got spoilt. My sister saved so many things that I wished for and surprised me with the Jo Malone English Pear and Freesia Scent. 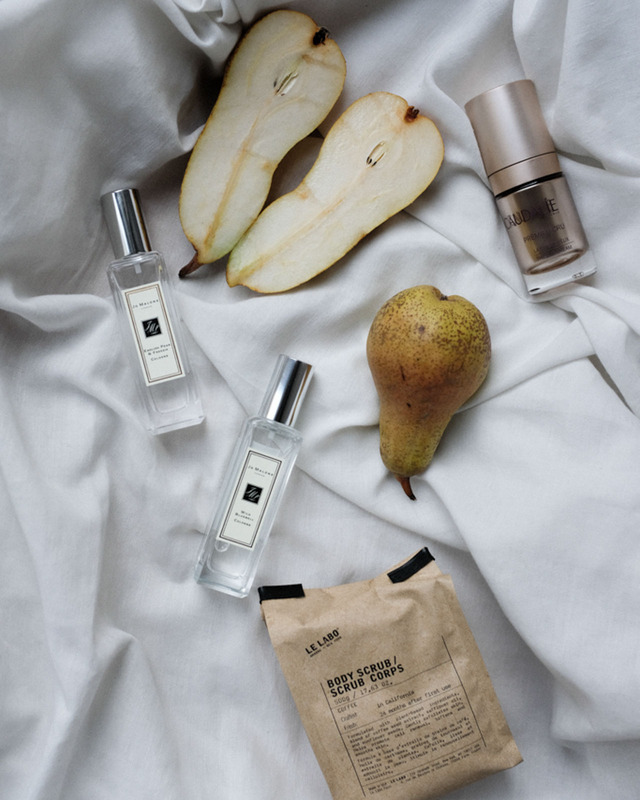 At one of the Events Debbie Wild, Jo Malone Lifestyle Director, recommended me to stack the English Pear and Freesia Scent with the Wild Bluebell Scent. It really does smell like a perfect match and I am more than happy to have found yet another scent which suits me well. If you follow my story on Instagram you probably saw me showing you the newest products from Le Labo. I was able to choose two products from the selection: Body Scrub and Scrub Shampoo. This Body Scrub is my Beauty Temptation this year. It’s formulated with blend of coffee extracts, safflower oil and sunflower feeds and has a rather creamy-grainy consistence which I find makes it easier to apply under the shower. And it sure does leave your skin nice and soft.